I’ve always loved this little town. A charming river front town, situated alongside the Trent and Neuse Rivers. A town that is the second oldest city in North Carolina with over 300 years of rich history. A town that was once the capital of North Carolina after being founded by a Swiss nobleman who named it after his hometown of Berne, Switzerland. A town dotted with life-size fiberglass bears, artistically displaying local businesses, helping to provide the picturesque scene depicted in some of Nicholas Sparks’ many books – including The Notebook. So, it seems only logical that if you’re vacationing in the Crystal Coast region of North Carolina, you’ll take the time to travel inland, for at least a day, to this beautiful little spot. And while this itinerary may be geared towards families with little ones, each of the attractions are more than appropriate to go sans-children. Maybe it’s because I grew up in Amish country, or the fact that I recently moved from my hometown and have been craving some good ole’ Amish cooking, but I would definitely recommend starting your morning off with a hearty breakfast at the Baker’s Kitchen Restaurant & Bakery. This cozy little restaurant is nestled away downtown in a beautiful brick building that was constructed in the early 1900s and hosts a variety of entrees, including their signature French toast paired with their famous butter syrups. Before leaving the restaurant, make sure to pick up some pastries or cookies from the bakery case, baked daily upstairs. This little gem has options for everyone! Open every day from 7am until 2:30 pm, Baker’s Kitchen serves breakfast the entire time – so if you’re not an early bird, you can still sample their goodies before heading out on your adventures. Next, head over to North Carolina’s first permanent state capital, Tryon Palace. Completed in 1770, this building was home to the Tryon family, and remained a site for the general assembly following the revolution, until a fire destroyed the Palace building in 1798. However, in 1959, after rebuilding the Palace and restoring the grounds, Tryon Palace was reopened to offer a place of testament to the state’s rich history. Touring the 16+ acre property will take a couple hours as you visit the Kitchen Office, a building that greets you with the sounds and smells of an 18th-century kitchen, the Stable House, the only remaining part of the original Palace complex, and the Gardens. The one day pass is the best route to take, offering visitation to not only the Palace grounds, but surrounding historical homes, and the museum galleries in the North Carolina History Center, which transports the family back to 1835, with hands-on activities in the Pepsi Family Center. Head over to the Cow Café for lunch, a popular site for locals looking for a quick bite from a menu that offers a full line of delicious sandwich baskets, hearty salads, and a kid’s menu with fun-named entrees like the “cow-cadoodle-doos” and “mooford’s oink & moo”. What makes this little spot so unique is the glassed-in production room which allows visitors to watch one of the nearly forty ice cream varieties being churned as they make their way to the kid-friendly area towards the rear of the building. The mission statement “to bring a smile to PEOPLE in need of a smile” is well achieved with the laid-back atmosphere, allowing visitors to spend their lunch-hour relaxing before getting on with their busy day. Treat yourself to one of their ice cream scoops before heading out, though! You won’t regret it! After lunch, head to the intersection of George and Pollock Street for an hour-and-a-half trolley tour with New Bern Tours. Running for over two decades, the tours provide visitors with the opportunity to experience the charm that New Bern, North Carolina boasts, by entertaining you with fascinating details and historical facts of this former royal capital. The tour includes a visit to the New Bern Academy Museum and the Cedar Grove Cemetery, amongst many more historical buildings and sites. And the best part is? Children under the age of twelve ride for free! If you haven’t noticed by now, New Bernians love their bears! As mentioned before, the town has fiberglass bears scattered all over downtown and the major highways running through the town. This came about for the celebration of the tri-centennial, when New Bern businesses sponsored and adopted these bears that were then designed by local artists to represent the theme of their business. At the time, there were 50 bears, but over the years, additional bears have been created and positioned through various locations in the city. Spend a little time searching for these bears around downtown while you explore the quaint little shops New Bern has to offer. One of my most favorite facts about New Bern is that it’s the birthplace of Pepsi. Prior to this cola being marketed as Pepsi, it was called “Brad’s Drink”, named after the pharmacist creator, Caleb Bradham. The pharmacist created the drink at his drugstore to help aid in digestion and boost energy, getting it’s name “Pepsi” from the roots of the word dyspepsia, meaning indigestion. The original site of the birthplace is the current site of the Pepsi Store. So, whether you’re an adult or a child, head on over and try a fountain Pepsi, created from a recipe that is unique to all other fountain and canned Pepsi drinks worldwide. Also, check out the historical memorabilia on display and their souvenirs for purchase. There’s nothing quite like sending a friend or family member a postcard to let them know you’re thinking of them, while giving them an interesting fact about your travel destination. Make your way around the corner to the Bear City Fudge Company and pick up a treat or two to take home. Established in 2003, this company began by selling over thirty different flavors of fudge and freshly baked cupcakes. The company has since expanded to offer all kinds of in-house specialties, including their bear claws, and nostalgic sweets like candy buttons and wax bottles. 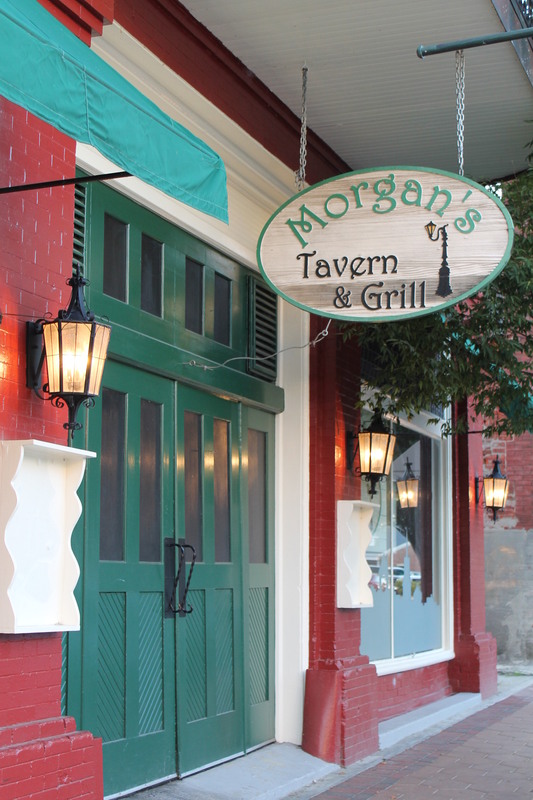 For dinner I suggest heading over to Morgan’s Tavern and Grill located in historic downtown. Calling home to a massive brick structure that was also built in the early 1900s, this restaurant offers a diverse menu (including a children’s menu). So, whether you’re in the mood for seafood, pasta, or a burger, Morgan’s has you covered. If you enjoy sampling craft beers, I recommend ordering the “Bear Claw”, which offers a sampling of all five of the company’s craft beers with 6 oz. samples. Morgan’s has partnered with the St. George Brewing Company to make this craft brewing experience possible. If you’re staying the evening in New Bern, I urge you to take the one-hour walking tour through New Bern’s Historic District with Ghosts of New Bern. The company is family friendly, so everyone from grandparents to young children can enjoy the tour! And the sidewalks on the tour’s route are designed to accommodate strollers, for those with littles. Make arrangements ahead of time, and enjoy a discounted dinner at the above mentioned restaurant (Morgan’s) with your tour booking! It’s hard to get over the charm of New Bern making it the perfect getaway for all sorts of tourists. Have you ever visited this historical city? What’s your favorite thing to do?